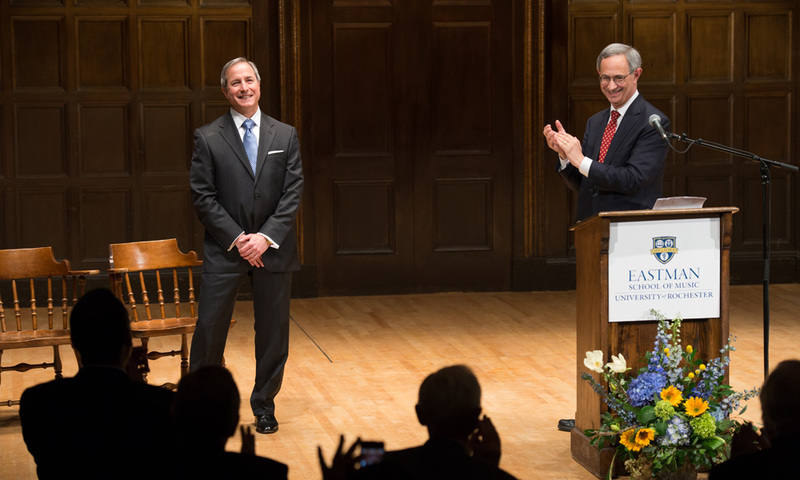 President Joel Seligman introduces Jamal Rossi as the Joan and Martin Messinger Dean of the Eastman School of Music. Jamal J. Rossi has been named the Joan and Martin Messinger Dean of the University of Rochester’s Eastman School of Music, pending board approval, University President Joel Seligman announced today. Rossi, 55, came to Eastman in 2005 as senior associate dean. He served as executive associate dean at Eastman from 2007 until September 2013, when he was appointed dean of the school following the illness and resignation at that time of former Messinger Dean Douglas Lowry. Rossi has served in leadership roles in music for more than two decades, has spearheaded significant collaborative educational and community initiatives and has wide-ranging experience in academic scholarship and leadership, teaching, performance, recording, and fundraising. As executive associate dean, Rossi was responsible for Eastman’s academic programs and personnel, including faculty hiring and promotions, and for academic and student affairs and enrollment management, among other duties. From 2006 to 2010, he supervised all aspects of the award-winning $47 million project to renovate Eastman Theatre and construct the Eastman East Wing. He oversaw a review of the undergraduate curriculum and led the School’s recent reaccreditation review by the National Association of Schools of Music (NASM). He also founded RocMusic, a collaborative partnership of arts and education institutions in Rochester to establish a free after-school music program for Rochester inner-city students. Renée Fleming, famed soprano and Eastman School alumna, said: “I am delighted to congratulate Jamal Rossi on his appointment as dean of the Eastman School of Music. His record of leadership as executive associate dean has demonstrated his vision and commitment. I am confident that he will lead Eastman forward with the creativity and passion needed to face the radically changing landscape for the arts, and the specific challenges for classical music and its vital place in our culture.” Fleming was involved in the search as a member of the Trustees and Friends Advisory Committee. Since being named dean in September 2013, Rossi has established a new partnership project with Chamber Music America and another with the New World Symphony, and he developed a new music leadership conference to be launched in the summer of 2015 at Eastman along with the deans from other leading music schools and conservatories. “The deanship of the Eastman School of Music is a key position in the music world, and the search for a new dean produced for us a remarkable pool of candidates from around the world,” said Provost Peter Lennie, who chaired the dean search committee. “But none of the other candidates could offer Jamal Rossi’s combination of vision, unwavering commitment to the highest musical and academic values, deep and broad knowledge of the Eastman community and its mission, and the personal integrity and commitment that have earned him the greatest respect from the Eastman faculty. I am delighted that he is willing to continue his leadership at Eastman in his new term as dean.” Lennie also thanked the search committee as well as the Trustees and Friends Advisory Committee for their outstanding work throughout the search. Before joining Eastman, where he is a saxophonist and also professor of woodwinds, Rossi was the dean of the School of Music at the University of South Carolina in Columbia for five years. There, he led curriculum revisions, secured funding for new facilities, and established several programs, including the Center for Southern African-American Music, the Southeastern Piano Festival, the Southern Exposure New Music Concert Series, and the Carolina Music Festival. Previously, Rossi served first as assistant dean and then as associate dean of the School of Music at Ithaca College between 1989 and 2000. He has also served as interim dean and acting dean in his time at Eastman. Rossi earned his bachelor of music degree in music education and saxophone performance at Ithaca College in 1980, his master of music degree in saxophone performance and literature at the University of Michigan in 1982, and his doctor of musical arts degree at Eastman in 1987. An active saxophone soloist and chamber musician, Rossi is featured on numerous recordings. He has given solo recitals and performed with community, college, and military bands and orchestras, including the Rochester Philharmonic Orchestra. A founding member of the Kilbourn Saxophone Quartet, Rossi was formerly a member of the Carolina and Empire saxophone quartets. He also played as a support musician for such jazz artists as Marian McPartland, Phil Woods, Jimmy Heath, Bryon Stripling, Les Brown, and others. Rossi is the author of the book Altissimo Repertoire Etudes. His articles and reviews have appeared in leading wind and educational publications. He is a frequent presenter at national conferences on such topics as musical entrepreneurship, developing student leadership skills, strategic planning and developing architectural spaces for music study and performance. He is active with numerous national, regional, and local arts and civic organizations, including NASM, the New York State Association of College Music Programs (past president), the New York State Council on the Arts, the Rochester Cultural Center Commission, the Finger Lakes Regional Economic Development Council, and the North American Saxophone Alliance. Rossi succeeds Lowry, who served as the first Joan and Martin Messinger Dean. Rossi is the seventh person to lead the Eastman School of Music as director or dean. The search committee consisted of Christopher Azzara, Paul Burgett, Jeff Campbell, Douglas Humpherys, Chien-Kwan Lin, Patrick Macey, Elizabeth Marvin, Honey Meconi, Carol Rodland, Reinhild Steingrover, Robert Swensen, William Weinert, David Ying, Ricardo Zohn-Muldoon, and Alan Czaplicki (staff to the committee). The Trustees and Friends Advisory Committee consisted of G. Robert Witmer, Jr. (chair), Renée Fleming, Marty Messinger, Sandy Parker, and Mark Volpe. The University of Rochester’s Eastman School of Music ranks among the nation’s premier music schools, boasting Guggenheim Fellows, Grammy, and ASCAP Award winners on its distinguished faculty. The school has been commended and recognized nationwide for giving its students an intensive professional education, entrepreneurial opportunities in their musical disciplines, and the experience of a broader liberal arts education within the University of Rochester. Eastman’s prominent alumni include opera singers Renée Fleming, Anthony Dean Griffey, Joyce Castle, and the late William Warfield; jazz musicians Ron Carter, Steve Gadd, and Chuck Mangione; composer-conductor Maria Schneider; and composers Dominick Argento, Charles Strouse, Kevin Puts, and Jeff Beal. The School presents more than 700 public concerts a year.